Sudden changes in your income – Whether you lost your job that led to decline in income or perhaps you got a new job that doubled what you made the year before, make sure you have all the supporting documents and proof of taxes paid. These two situations suggest the IRS that you might be potentially misrepresenting your income by not declaring all of it. 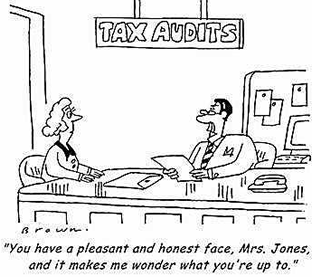 The IRS receives reports from your employer so they can verify the truthfulness of the information on your return. If your income has gone up, the IRS wants to know if you paid taxes on all of it. Wesley Snipes, who is currently serving a 3-year sentence for tax evasion, is a testament to how serious the government is about enforcing penalties. Business deductions – This is arguably one of IRS’s favorite places to look into. How ideal it would be to write off any meal we grab or vacation we take, but it’s not that easy. In case of deductions, they really have to relate to doing business. If you’re writing off $300 bottle of wine, better keep a copy of a major contract you signed to prove it was an appropriate purchase (by the way, a $300 bottle of wine is never appropriate). Hold on to all the receipts and jot down some notes on the back on whom you dined with and the purpose/topic of the meeting. Another expense closely monitored is car expense. Hardly anyone keeps a mileage log but the least you can do is to write it down at the beginning and the end of the year. If you used your car for some other purposes then just multiply the total number of miles driven that year by a percentage that you think most adequately represents the usage of the car for business purposes. And finally, running a business from home and associated expenses. Unless you spend most of your time working in your home office, don’t even try that. The same logic applies to office supplies. You can’t buy a computer for video games and claim it as a deduction, unless you’re a video game beta tester. A rule of thumb with any deduction should be asking yourself a question, would you spend money on that particular product or service if you didn’t run a business? If your answer is negative, then it most likely is a deduction. Hobby – We all have favorite pastimes to which we dedicate time and money. IRS wants to draw a clear distinction between business and fun. In case you want to claim the expenses associated with your hobby as business expenses, the activity has to have objectives of a business, i.e. providing services or goods, generate sales, etc. If you don’t plan to sell anything or have clients, you will most likely not pass the IRS questioning. I wish everybody could do for a living what he or she loves, but the IRS needs to see your emotions displayed on paper and in numbers. Donations – You earn $50,000 per year and claim a $40,000 donation to your favorite charity; rest assured the IRS would like to see the proof of it. There are couple of things that raise a red flag when it comes to donations. The first one is the proportion of money (or value of donated goods) to your annual earnings/revenues. While it is absolutely possible that you donated everything you earned and some more, you better have all the necessary proof should the IRS ask for it. The second one is the misrepresentation of value of donated items. Claiming that a monopoly game you gifted at a local fundraiser is worth a $1,000 might bring additional scrutiny to your tax return. The best way to avoid it is to state the real value of donated goods and anything that might be of unusual value should have enough proof to deter the IRS from further questioning. Audits happen to thousands of taxpayers and next time it might be your turn. You might even alarm the IRS because you were sloppy preparing your taxes and made a mistake here or there (all it takes to put one zero more or less). So whatever you do, document everything. Keep all your tax documents including all forms and receipts in the designated place at home. Don’t get anxious to throw them out to clear space. There’s a good chance you can find the needed space elsewhere recycling some less important stuff. Organizing and documenting all your activities is a lot of work and will become quite tedious but that’s the price to pay to sleep comfortably. Remember, the better prepared you are the easier it will be to get through an audit.